The panda cub snuffles, stretches out a tiny paw and snuggles with his mother, Cao Cao. She stirs, sniffs him gently and gives him a lick as they rest in her maternity enclosure at the Hetaoping Wilderness Training Base in the mist-wreathed mountains of southwestern China. The cub, two months old and too small to be named, is the size of a house cat. He and his sister are rare genetic treasures, the first twin giant panda cubs born to a wild male panda and a female sent back into the wild to mate. In the last two years, Cao Cao, a mother of nine, has given birth to the only three progeny of an ambitious return-to-nature programme that Chinese scientists hope will save the species from extinction. Cao Cao, 16, was born in the wild herself before being taken into captivity in Sichuan when she was about 13 months old. One of her male cubs, Tao Tao, was released in 2012 and has since been recaptured twice for health checks and so he could be fitted with a new tracking collar. Researchers believe Tao Tao may have sired a cub, but they will have to wait until the cub is an independent adult to do DNA testing. Wild pandas, once found in 17 provinces, now survive in just three. Their habitat is fragmented, with 73 per cent in groups so small there is a strong chance they will not survive, according to a 2017 report from Beijing Forestry University. In some places the wild population is less than 30, in some less than 20. If we don’t help them, they’ll be extinct within the next 30 to 50 years. Back in the 1970s, the overall panda population dipped to about 1,000. In response, the Chinese government spent tens of millions of dollars to establish training centres, and forest reserves, helping the numbers recover to roughly 2,200. Of those, roughly 25 per cent reside in the scientific centres, zoos or other such facilities. The roly-poly celebrities are replete with political and cultural significance, and economic value as a tourism drawing card. So to ensure their long-term survival, China has initiated a make-or-break experiment sending captive pandas into the wild permanently to boost fragile populations scattered in six isolated mountainous regions. Equally vital is a plan for a five-million-acre conservation park — twice the size of Yellowstone National Park — that is to include 67 current reserves and be financed by the Bank of China at a cost of $1.1 billion. Researchers hope the park, due for completion by 2023, will ensure the successful release of dozens of captive-bred pandas to reestablish wild populations in areas that have not seen them for decades. The Hetaoping base, where Cao Cao usually resides, has released four captive-bred females since 2016 in hopes they would mate with wild males. Cao Cao is the only one with a confirmed pregnancy. At Hetaoping, cubs are prepared for release largely without human contact. They are raised by their mothers in large bushy enclosures until independent, then moved together to larger isolated compounds. Their only interaction with humans is with the keepers who deliver bamboo daily, dressed in panda suits liberally soaked in panda urine to cover the human smell. Anyone visiting the centre must don the urine-soaked suits. Training to survive in the wild is left to the mothers. The base is silent apart from the stirring of wind, with not a whisper of traffic. Thirty observation cameras transmit images to 16 screens in the base, watched around the clock by panda keepers. 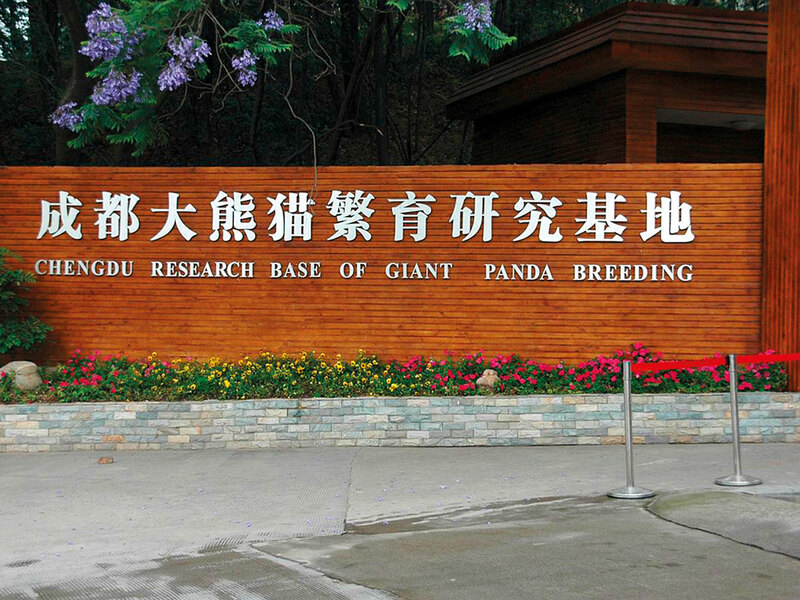 A second centre — Chengdu Research Base of Giant Panda Breeding in the Sichuan capital, Chengdu — has taken the opposite approach. At Chengdu, operated in collaboration with Virginia-based Global Cause Foundation, humans train the bears to eat, climb trees and find water, making it easier to intervene when they are injured or sick. The base is a major tourist attraction, with up to 100,000 visitors daily and thousands filing past the panda nursery, furiously snapping photos while guards shout at them to move along. The problem is that whatever the approach, the release of pandas can prove physically dangerous (for the pandas) and politically delicate (for the humans), since the public reacts with outrage to any sort of panda suffering or fatalities. Of 11 pandas thus far released permanently by the two centres, three have died and a fourth, Qian Qian (pronounced Chen Chen), got sick and would have perished had she not been rescued, her story the focus of a recent IMAX movie, Pandas. But for Zhang, the lifelong mission has at times proved heartbreaking. He recalls desperate experiments — based on guesswork — back in the 1990s, when the survival rate of captive born cubs was only 33 per cent. In those days, cubs frequently died of malnutrition as researchers tried milk from cows, goats and even humans, before determining that panda milk alone keeps panda cubs alive. Now, virtually all captive-bred cubs at Hetaoping survive to adulthood, even the twins, which mother pandas do not support on their own. Cao Cao’s keepers must switch her cubs every two days to ensure both get equal amounts of maternal care and milk. Nursery staffers feed the switched cub panda milk, and swab it with cotton wool dipped in warm water to provide warmth and contact. When they are two years old, cubs are deemed ready for release. But the life of wild pandas is extremely difficult. Sensitive and solitary creatures, they reside in rough mountainous terrain, spending much of their time chomping nine to 18 kg of fibrous bamboo daily in order to survive. They don’t hibernate because bamboo doesn’t allow them to gain enough fat. Captive-bred male pandas also face challenges in the wild from aggressive, territorial males, not to mention other species. Females are less likely to face issues with wild pandas, but stress, as well as bites from feral dogs and leopards pose a mortal threat. Zhang, known in China as the Father of Pandas, says one of his worst moments came when the first captive-bred panda released after years of research and training died just a year later. That panda, a male named Xiang Xiang, was attacked by other animals and either fell to his death from a cliff or a tree, perhaps cornered or fleeing in confusion. Zhang says he was devastated because the bear’s training evidently left it ill-equipped for life in the wild. At the time, Zhang said, researchers were basically making things up as they went along. Hetaoping panda keeper He Shengshan agrees. From then on, Hetaoping researchers have sought to avoid human training and contact. The panda release project resumed four years later, and it took another two years of training for Tao Tao (Cao Cao’s cub) to be prepared. A top Communist Party official opened the cub’s cage and he wandered up a track, clambered into the forest and disappeared. The issue of whether he is now a father will be determined when the possible offspring is an adult and DNA in stool samples can be tested. Training by humans didn’t help He Sheng, a male from the Chengdu base released about the same time. He died of infection a few months later after he was attacked — possibly by feral dogs. Zhang Zhihe, director of the Chengdu centre, shudders visibly when asked about the stories and names of Chengdu pandas being trained for release. After He Sheng died, critics accused the centre on social media of “murdering” pandas, Zhang recalls. When Cao Cao was released temporarily to breed with a wild male, a team of panda trainers and keepers followed her closely, checking for signs of injury or hunger. “We know Cao Cao very well so we know when she’s in heat. It takes a week before a wild panda approaches, so we leave her to do her thing,” He said. They monitored the mating through recordings and she was returned to the base. “She has a really mild, easygoing nature and it’s very easy for us to look after her. When we wanted to build a bond, her trusting personality really helped,” said He. He calls Cao Cao a “hero mother”, having given birth to three sets of twins and three others. Three young pandas from multiple mothers are now being prepared for release from Hetaoping. 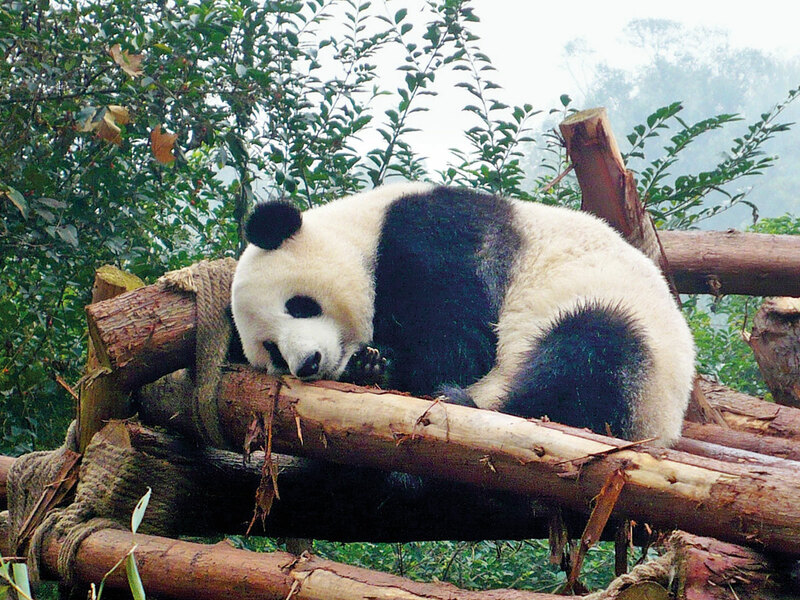 The reintroduction plan cannot be considered a success until pandas not only survive, but also reproduce and raise wild cubs that survive and reproduce.